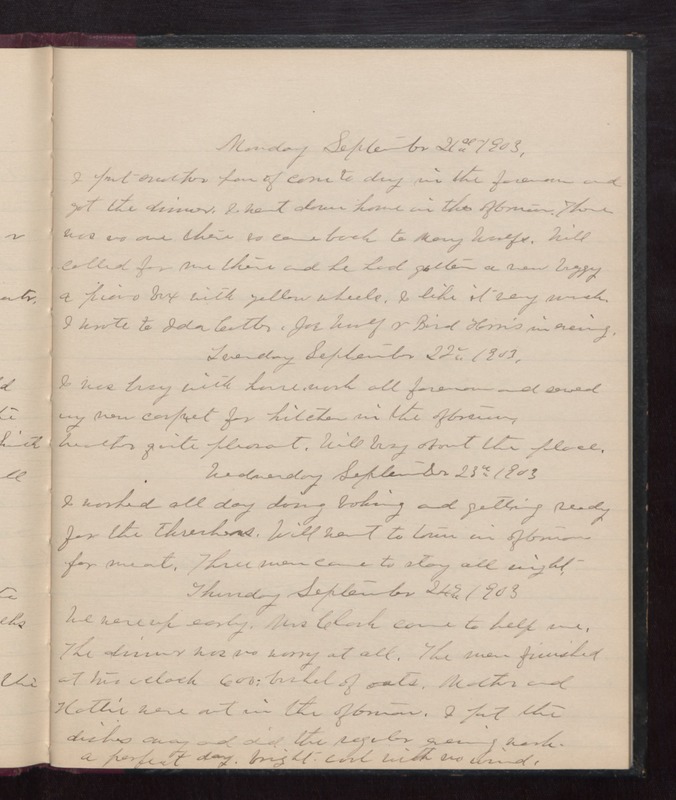 Monday September 21st 1903 I put another pan of corn to dry in the forenoon and got the dinner. I went down home in the afternoon. There was no one there so came back to Mary Woolfs. Will called for me there and he had gotten a new buggy, a [piero?] box with yellow wheels. I like it very much. I wrote to Ida Cutler, Joe Woolf & Bird Harris in evening. Tuesday September 22nd 1903 I was busy with housework all forenoon and sewed my new carpet for kitchen in the afternoon. Weather quite pleasant. Will busy about the place. Wednesday September 23rd 1903 I worked all day doing baking and getting ready for the threshers. Will went to town in afternoon for meat. Three men came to stay all night. Thursday September 24th 1903 We were up early. Mrs Clark came to help me. The dinner was no worry at all. The men finished at two oclock 600 bushels of oats. Mother and Hattie were out in the afternoon. I put the dishes away and did the regular evening work. a perfect day, bright cool with no wind.